As you can probably imagine, Engadget HQ has been boiling over with heated discussion of Apple's new iPad today. Love it or hate it (and a lot of you seem to hate it), it's hard not to see it as a pretty bold statement of what Apple thinks general-purpose computing should look like in the future: a giant iPhone. As you can imagine, that's a provocative vision, and it's simply not possible to try and condense the opinions of the staff into one Grand Unified Theory of the iPad -- so we're going to do what we did for the Kindle DX and the Droid, and let everyone speak for themselves. Let's kick it off with the three people who've actually seen and used this thing: Josh, Ross, and Joystiq's Chris Grant. If people walked away disappointed from the iPad launch today, it's likely they had some lofty ideas of what the device might do before Jobs ever took to the stage. At Engadget, we tend to mull over a lot of ideas about upcoming products without ever really getting too attached to them -- so when we finally saw what Apple had created in the iPad, it wasn't exactly a shock. What is was, however, was fairly underwhelming. Maybe underwhelming isn't the right word. Unimaginative might be more accurate. I know that I'll find a reason to drop $500 (at least) on this thing -- but for the vast majority of consumers, I think the case for the iPad has yet to be made. There's no question that much of what the iPhone and iPod touch do translates nicely here, and there's no question that some of the tweaks made to native iPad apps are impressive, but nothing I saw made me sit up and think, "Wow, I need this." It's telling that the most intriguing user experiences shown off today were the iPad versions of the iWork suite. iWork? If Steve Jobs hoped to answer the question about why we need this third device, or how it's better than a netbook, he didn't make a compelling case. Where is video chat? Where is multitasking (honestly, only one app at a time for a device of this size and speed)? Why is the lock screen so embarrassingly empty? Why are there no active widgets to fill that huge homescreen space? Where is the expansion of the multitouch user experience? And seriously, where are the media partnerships? Now there isn't a doubt in my mind that the iPad will really come into its own when developers get their hands on it, and I know that I'll find a reason to drop $500 (at least) on this thing -- but for the vast majority of consumers, I think the case for the iPad has yet to be made. A jack of some trades, a master of none. Let's forget about all the hype and expectations (or at least pretend we can). When Steve Jobs came out on stage, he presented a compelling argument to justify a third product tier, but the Apple iPad doesn't live up to that potential. For all its horsepower, we're still relegated to one app at a time. For all its talk of being a great web experience -- and it is really snappy -- we still don't have Flash. The New York Times app showed promise for newspapers and magazines, but for now the experience unfortunately seems to be the exception, not the rule. There are some cool ideas in the iPad, and I was happy with the multitouch keyboard (though not nearly enough to justify writing a book with it), but the new and upgraded apps weren't that dominantly better. Many of my favorite iPhone apps are great because I can conveniently pull it out of my pocket and check things contextually -- Yelp, FourSquare, etc. It's the device's raison d'être. For me, in a nutshell, the iPad is a larger screen iPhone with fewer capabilities. It's not bad -- in fact, web browsing is awesome and the device we saw was super fast -- but I have no way to justify this in my gadget collection. Not for $630 -- let's be realistic, 3G is a must -- and not until we at least see more compelling third-party apps that give the thing an unique edge. With the App Store effectively splintered across the iPhone/iPod Touch and iPad "platforms," I'm not sure the device offers enough incentive to gamers to opt for an "iPad-enhanced" version. Without any iPad games available to really see what developers are able to do with the new device, I can only judge it as a larger iPhone and, well... it's larger. To be fair, that allows for more room for on-screen controls (a huge plus for those of us cursed with largehanditis) and responds better to tilt controls without taking the display out of your line-of-sight. But if you're at home, with actual gaming consoles around, will there be any draw to play higher-res iPhone games? As a portable gaming platform, the iPhone represented a sea change in quality; at first blush, the iPad carries no such distinction. Maybe I'm too much of an optimist -- you know me, the happy optimist, right? -- but all this instant negative reaction to the iPad just conjures up memories of 2001, when Slashdot famously dismissed the iPod as "lame." I'm far from sold on the iPad as it was presented today, especially without the ability to multitask, but there's a lot of potential there -- the promise of this thing isn't necessarily in what it can do out of the box, but what it can do once app developers start feeling out the boundaries of a multitouch user interface on a larger screen. I'd love to see what a DJ or music creation app on the iPad looks like, or how a video editing app might work, and I'm very curious to see how game developers approach casual multiplayer gaming. Like it or not, Apple's way out in front of multitouch computing, and the iPad is at the very least fertile ground for experimentation. Will it replace my laptop? Never. But it could certainly serve as an able replacement for a netbook or an e-book reader -- especially since I think the choice between a $489 Kindle DX and a $499 iPad swings firmly in favor of Apple. Like mostly everyone else on staff, I think the right approach to the iPad is to wait and see; I think the difference for me is that I'm assuming we'll eventually see something good. First, the obvious: there was absolutely nothing Steve Jobs could've done, said, or unveiled today to live up to the unprecedented lather the internet had worked itself into over the past few weeks. Taken in that context, the iPad is a huge letdown -- no groundbreaking display technology, no advanced user interface, no particularly interesting ways for the device to interact with the other devices and computers in your home. If you step out of that context, though, and look at the iPad in a vacuum, does it make sense? This is simply Cupertino's answer to the smartbook executed with typical Apple spit and polish, and whether anyone really needs the world's slickest smartbook remains to be seen. The jury's going to be out for a couple months, but my early feel is that it doesn't. The iPad takes all the disadvantages of a MID -- primarily the fact that it doesn't run a desktop-class operating system -- and combines it with all the disadvantages of a larger-format device, leaving you with a giant iPod touch. You can't carry it around the same way you do a smartphone (and even if you could, you couldn't make cell calls on it), but you also can't use it to run your favorite Mac apps on the go. What's more, it suffers from all of the same software restrictions the iPhone does -- you live in Apple's world and play by Apple's rules. The company would have you believe that they've created a new kind of product with the iPad, but let's be real: this is simply Cupertino's answer to the smartbook executed with typical Apple spit and polish, and whether anyone really needs the world's slickest smartbook remains to be seen. I don't think Apple is in any way overstating the fact that the iPad is revolutionary technology at magical pricepoint, or whatever superlatives they've thrown against this thing in the last five minutes. Unfortunately it's revolutionary magic that I don't really have much use for... yet. See, I want Apple to reinvent the personal computer, not introduce a third device into my life. I want to eliminate my too-expensive, too-big, too-overthought laptop with a $500 or $600 laptop-lite device that does all my core tasks excellently. I want to cut the fat. And in a way, the iPad is delivering on very much of that promise. I think the iWork aspects are pretty remarkable from a creation standpoint -- at least I hope they are, and will be curious to find out what I think after I've played with them. Interfaces are meant to be challenged, and I think the iPad shows that a large touchscreen device can replace much more of my laptop's functionality than I might've given it credit for. Still, it's lacking some core competencies like the iLife suite and the ability to manage other devices (like my iPhone, for instance) that are absolutely vital to my daily life. Mainly, it's lacking a physical keyboard. And by "keyboard," I mean an input mechanism that's always there, and is attached to the device and its core functionality. Sorry, but I'm nostalgic like that (though the keyboard dock does look fun). Overall, the device just doesn't do anything I can't already accomplish more excellently with another device: I produce content on my laptop, I consume content on my TV, and there's no way you're convincing me that you can have the best web surfing experience without a keyboard. But of course, I don't think Apple is done with the iPad, I believe they're just beginning, and over time I hope to witness the sort of "killer apps" and evolution of functionality that could turn this device into something wholly more vital. That's why I'm disappointed in the product as it stands for my own use, but not at all disappointed in Apple bringing it to market: I think it's a stepping stone for a new kind of computing that could truly be "revolutionary" and "magical" to a whole different class of people than ergonomically-challenged couch surfers. Man... it's here, the Apple tablet. Still digesting that to be honest. Unlike the iPhone feature set, however, that surprised the world when announced, the iPad was pretty much a known quantity when Steve Jobs took the stage today. Will I buy it? Well, like any bright shiny gadget announcement my initial impulse is always, I have to have that. But then reality sets in: do I really need a third device? Don't get me wrong, I can definitely see using the iPad for media consumption and light content creation especially when toting an attached Bluetooth keyboard. But I already have a smartphone and a 15-inch laptop with discrete graphics. And I don't own a netbook (too slow) or an e-reader (too E Ink-y) because I simply don't want to carry around a bunch of crap that overlaps in functionality. I do like the fact that the iPad OS is custom built on a custom processor targeting specific use cases and thus, presumably optimized -- that already gives it a leg up on general-use devices like UMPCs, MIDs, and netbooks running OSes built for desktops. But I'll be waiting for the performance benchmarks and our review before making a purchase. You're going to call me bitter, or just overly harsh. I don't care. The iPad is, in my mind, one of Apple's biggest misses. If it were positioned as the second coming of the e-reader, it'd be a runaway hit. It can do everything the Kindle can, but it adds a color display, multitouch gestures, a killer battery and a processor that's quick enough to play back video. It's (at least) twice the price of a Kindle, but it's roughly twice the device. If Apple would've marketed this as its play in the reader sector, I would've been duly impressed. But, it didn't. Instead, Jobs had the nerve to slam netbooks (which I personally think are far too weak and small to be used as serious machines), and whether he intended to or not, he essentially compared the iPad to the system Cupertino refuses to build. I can't begin to explain how disappointing this device is in the sense of being a usable computer. There's a 1GHz CPU in there that can't even be used for multitasking. There's no camera for video chatting. There's no way to watch a Flash video and chat within an IRC client at the same time. There's not even a way to connect a USB device to this without paying Apple extra for an adapter. The iPad is remarkably limited in scope and functionality, and for no good reason. A netbook can run circles around this in terms of actually getting work done, and if I want to enjoy multimedia, I'll carry around something that can fit in my pocket. As I mentioned, you'll say I'm just missing the point, but this thing does absolutely nothing for me in its current iteration. I'm not going to form an opinion until I actually read with the iPad, but it looks like the best alternative to an actual book I've ever seen. whether to bring my laptop or not. In the situations where I don't... I make do with my iPhone. That said, the iPad is compelling to me for a number of reasons. First off, it looks like it's going to be a major player in the e-reader department, and as an avid reader, I have always been disappointed with current options that are not physical books. I'm not going to form an opinion until I actually read with the iPad, but it looks like the best alternative to an actual book I've ever seen, and Apple's book buying experience is sure to be more enjoyable to me than Amazon's, which I've always found irritating. Keep in mind, I take no issue with paying up to $20 or $30 for a book, and routinely do so. So... what else can it do for me? Well, it looks like it's going to serve up a better e-mail experience than the iPhone does (I'm not a superfan of that experience by any means! ), and Safari's always offered a great browsing experience. So yes, I'm intrigued. To say the least. For me, it'll probably come down to cost vs. need (or want). It's not cheap, and as a current owner of both an iPhone and a MacBook Pro, what will it take for me to justify this purchase? We'll have to see... when I touch it. Doing without the capabilities of a real PC and the inherent connectedness/portability of a cell phone puts the iPad in an interesting though previously uninhabited middle ground, but the $499 minimum entrance fee means I'll only be looking from this side of the fence for now. Making it more capable by adding a dock/keyboard or 3G connectivity enhances its appeal but drives up the price further, and without proper multitasking support or a more open platform its focus remains artificially narrowed beyond what I can handle. Media playback capabilities, e-reader and gaming functions are shiny and good looking, but where's the substance? I'd like to avoid the transcoding necessary to play back media on my phone, enjoy the wide access and support that I have using a PC to browse the web or create content and hopefully have a dollar or two left in my pocket afterward. "Not good at anything" commentary aside, the iPad isn't built or priced to compete with my current go-to combination of phone and netbook -- that may work for Apple, but at this stage of the game it won't work for me. I think it's interesting that Apple's focus with the iPad (at least initially) seems to be much more on consumption than creation, contrary to what the oft-analyzed invitation to the event seemed to suggest. The iPad-specific Brushes app demonstrated certainly looks impressive, and there will undoubtedly be many more third-party apps to follow, but the lack of an iLife suite to go along with iWork is a bit telling. Why not a touch-friendly version of iPhoto to go along with the camera connection kit? Or a streamlined version of iMovie or GarageBand for that matter? Guess maybe we have to save something for OS 4.0. Before Steve revealed the iPad, he took a shot at those ever-so popular netbooks: "They're not better at laptops than anything -- they're just cheaper." Touché, Mr. Jobs, but it's also easy to argue that a $399 netbook can do a number of things better than the $499 Apple iPad -- like multitask, play Flash video and make a video call. Touché, Mr. Jobs, but it's also easy to argue that a $399 netbook can do a number of things better than the $499 Apple iPad -- like multitask, play Flash video and make a video call. Not only do I disagree that netbooks are stupid, but I also don't think his comparison of the iPad to netbooks is valid from the start. While they're both different takes on the 'tweener --- that device between laptop and a smartphone -- the iPad is more than a netbook. With its content ecosystem (especially in the realm of e-book realm), affordable 3G connectivity and touch interface, it's a whole new category of mobile device -- one maybe more akin to a MID or e-reader if we're forced to compare it to something. And in turn, the netbook -- with a full operating system and robust performance capabilities -- is more than an iPad. The "iPad is a netbook killer" argument is just foolish -- it's like saying the iMac has killed DVD players. There's overlap there, but they serve very different needs. At first glance, it appeared to be something magical and fantastic, maybe even mythical. But as the harsh reality of the facts began to sink in, my hopes and dreams for a revolutionary device were crushed. 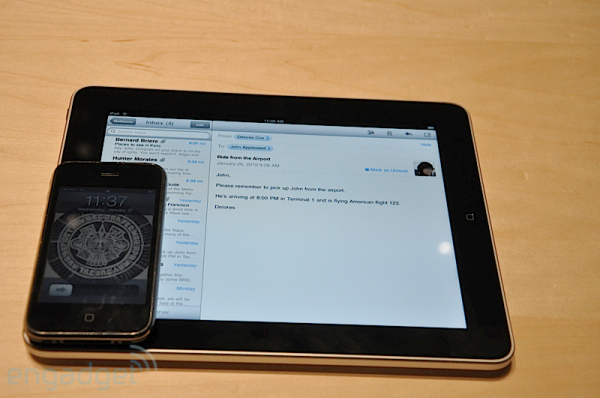 The iPad appears to be an enlarged iPod Touch, with a few minor (key word: minor) software tweaks. Sure, it's faster and has a better / bigger display, but I was looking for something new and innovative. I was (possibly naively) expecting a device that could perhaps substitute for, or even replace my MacBook Pro and iPhone 3GS. I was also shocked and saddened to find that the iPad runs on what seems to be just a fancy version of iPhone OS. Thanks to Apple's decision to hamstring it in the software department, it's missing key elements that steered my interest away: the ability to multitask, a front-facing camera and support for Flash (to name a few). Until we see those features implemented into the device, the iPad will remain an expensive toy in my eyes. What we saw today simply didn't live up to the hype, though it's probably fair to say that nothing could have after years of embellished buzz. Next-gen iPhone for me, please. As excited as I was at the prospect of a sleek, always-connected internet tablet from a company that knows a lot about making attractive mobile devices, I can't help but feel that Apple has put itself into a corner with the iPad. Yes, the iPhone OS is cool, but at the end of the day, it was created for the iPhone. I got past the lack of multitasking on the iPhone / iPod touch because of its 3.5-inch screen, but with the introduction of the iPad, I suddenly have a whole 9.7 inches. And what can I do with this newfound screen real estate? Well, the same exact stuff I could do on the 3.5-inch one. Apple's pimping this new A4 chip as "a screamer," yet they still won't let me run more than one app at a time. How can you bill a device as a step down from a full fledged laptop and a step up from a netbook, but not allow users to open a web browser and an instant messaging client at the same time? It's not like we're pressed for space any more, and some sort of window management -- something like the webOS card interface -- would allow for seamless integration and multitasking. For me, the iPad is a great concept with seemingly great specs (and a very attractive entry price tag), but at the end of the day, I don't see anything revolutionary. That said, I think there's a whole lot of potential here, and hopefully through some updates to the OS they'll fully recognize the power of the hardware they've brought to the table. Until then, however, I guess I'm stuck with an overpowered, larger-screened iPod touch with an optional built in 3G connection that'll run me an extra $130. Well, that's what we think -- and as you can see, we're definitely not all on the same page. So now we have to ask: what do you think?